Read a new set of questions as given in Daily Current Quiz - 21st May 2018. These have been picked up from all the Latest News of the weekend and we hope this will be of immense help to those who are preparing for government examinations like IBPS PO, IBPS CLERK, SSC CGL and SSC CHSL. Aspirants should go through these in details as we have provided proper explanation and answers along with each of the topic. 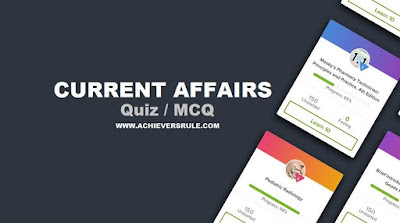 We also advise our readers to go through the Daily Current Affairs Updates before solving the quiz. Q1. Which day is observed as International Museum Day ? Q2. which day is observed as Anti-Terrorism Day ? Q3. Who is the Chairman and Managing Director of Coal India? Q4. Who has been named as the president of Hockey India ? Q5. Which institute has set up India’s first Centre for Energy Regulation (CER)? Q6. How much fine did RBI impose on South Indian Bank ? Q7. which is the most wealthiest country in the world? According to the AfrAsia Bank Global Wealth Migration Review, India is the sixth wealthiest country in the world with a total wealth of USD 8,230 billion..
Q8. World’s First Floating Nuclear Plant has been unveiled in which country? Q9. The 26th BASIC Ministerial Meeting of Environment Ministers was held in which country? Q10. Who won the European Golden Shoe for the fifth time? Q11. Who has been confirmed as CIA's first female director? Q12. Which word have been added in in Hindi and English languages for scientific and technical purposes ? Q14. India’s Jagriti Yatra won charity award in which country? An Indian charity that organises 15-day train journeys around India to understand and build the India of smaller towns and villages through enterprise has won an award in UK,London.